Now that you’ve gotten a refresher on how to use Instagram for your nonprofit, let’s take a closer look at a great place to start integrating Instagram with your peer-to-peer event ... Charity runs! These events – ranging from 5k to 10k to even walk-a-thons – are all about entrants seeking out sponsors and raising money for the hosting charity. But when you step away from the strict running events, you get into “fun runs”, which is where the charity run fits in perfectly with Instagram. 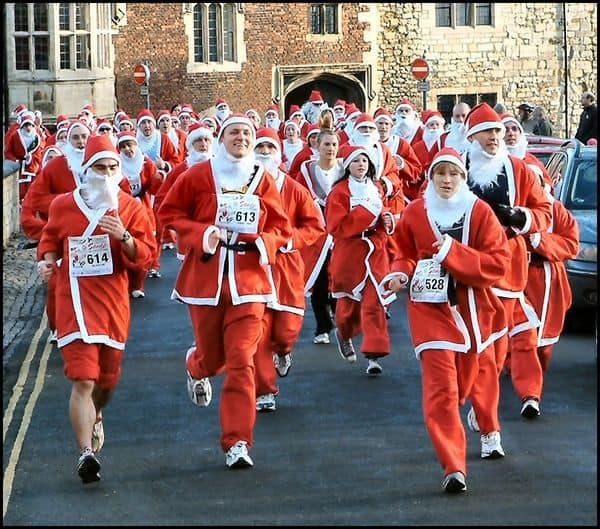 As you can tell, “Santa Sprints” are popular at this time of year, along with the “Turkey Trot” around Thanksgiving. Also, it’s not quite a run or a walk, but we’d be remiss if we didn’t also mention a big fundraiser of the season: Polar Bear Plunges, where participants raise funds for the chance to jump into freezing water around New Year’s. They make for fantastic photo ops when cold, laughing participants come stumbling back onto land! It’s important that you determine what hashtag you want to use for your charity run, and then plaster it prominently on your collateral so runners know what tag to use when they upload photos to Instagram. (This is great for any P2P event, not just marathons!) You may even want to look into putting the hashtag on running bibs as well for extra exposure. Since Instagram also allows for video and live-streaming, encourage your runners to record some video footage to upload. Whether it’s capturing the moment at the starting line or live-streaming the excited crowds as they run together, Instagram’s video feature is a colourful and dynamic addition to the platform that can be used well during a charity run! It’s also a great way to make people feel involved, even if they couldn’t physically be there. Since participants are going to be Instagramming pics anyway, it’s a smart move to make it easy for them. Set up a little photo-worthy backdrop at the finish line so exhausted-but-happy runners can get a commemorative pic. Also, since you can track the event’s official hashtag on Instagram, consider holding a contest for the best event photo. This should encourage even more hashtag usage and a wider spread of your cause! Still at a loss for ideas? Take a look at the #charityrun hashtag on Instagram, and specifically look for P2P runs that your nonprofit would like to emulate. You might just come away with a whole host of new ideas and inspiration for making your charity run Insta-famous!